Most babies are born farsighted, but as a child develops, their vision becomes more normal. However, nearsightedness often develops. Most people who need vision correction for nearsightedness will begin having symptoms prior to the age of 25. Some of these may be indicative of other problems, but if you feel like your child is having issues with his or her vision, it is important to have the child checked. If left untreated, it may result in problems in performance and even behavior at school. 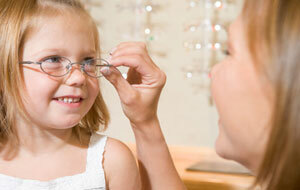 Depending on the issues, a child may need glasses or vision therapy. Some will only need to wear glasses when reading and doing other close work. Sometimes this will help the vision problems to correct on their own, and the child will not need to continue wearing glasses after they are resolved. Even those who have never needed glasses or contact lenses may begin experiencing vision problems as they age. After around 40 years old, many problems can develop, which aren’t typically issues for younger people. Glaucoma: A condition that may not present any symptoms, glaucoma can eventually lead to blindness if not treated in time. This condition is caused by fluid pressure building in the eyes. Eventually, this pressure stops blood from flowing through the arteries to the retina. The only way to catch glaucoma early is through routine eye exams. Presbyopia: When presbyopia begins, it can affect the ability to see things close-up. This is caused by the thickening and loss of flexibility of the crystalline lens, which affects light refraction and thereby the ability to focus. Retinal disorders: Conditions that affect the retina become more common as you age, and can result in central vision loss. They must be diagnosed early in order for treatment to be successful, so it is important to get exams regularly. Spots and floaters: Visual disturbances such as spots and floaters become more common as people age. This is due to imbalance of vitreous and liquid substances in the eye. Generally, floaters are not a big deal, but they can be indicative of a greater issue, so having them checked out is a good idea. Television can be hard on the eyes. It is best to watch TV with the lights on in order to avoid high contrast between the picture and your surrounding area. This can be accomplished by adjusting the brightness on your TV. Sitting close to the TV is not as harmful as some people may believe, but it is still best to sit farther away in order to see the picture better. When a child continually sits too close to the TV, it could be an indication that he or she has nearsightedness, so this may need to be checked. If you notice that your eyes water, or you frequently have headaches during or after watching TV, you may need glasses to wear while viewing. It is best to check with your eye care provider if you are experiencing issues. Try to set up your TV where there will not be too much glare from windows or lamps, and do not just sit and stare at the TV for hours on end. Take breaks and do other things between watching sessions. Your vision can, obviously, have an effect on how well or easily you can read. There are many factors that go into your ability to read, based on vision factors. Distance vision: You must be able to see well at a distance in order to read comfortably. Depth perception: You need to have functioning stereopsis, which is the ability to tell how distant objects are. Direct vision: Sometimes called fixation, the ability to focus on an object is necessary to read. Focus adjustment: It is necessary to be able to shift your vision from near objects to far quickly in order to balance looking at your surroundings and at your book or paper. Close vision: You must be able to focus on close objects, bringing your eyes closer together as you near an object. Ability to fuse images: Both eyes must be able to work together to form one image. This is also known as binocular fusion. Recognition: You must be able to take in visual stimuli and organize it in your brain. These skills must be developed as you learn to read. When you have vision related problems, they must be treated in order for you to be able to be able to read well. If you suspect a vision issue is playing a role in hindering your reading, you should see an optometrist right away.